Open happiness or open diabetes? Big Soda’s advertising would have you believe its products are all part of a healthy, active, vibrant life. The reality is much different: Sugary sports drinks and sodas are fueling chronic disease and ruining the health of millions. It’s time to push aside celebrity endorsements, catchy jingles and clever slogans to tell people the truth: Sugar is toxic. From Nov. 8 to 19, CrossFit Inc. 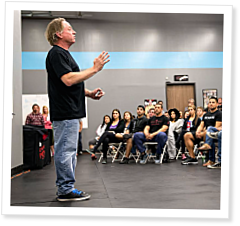 Founder and CEO Greg Glassman visited nine California affiliates as part of CrossFit’s “California Invasion: Rally to Fight Big Soda.” At each affiliate, he asked attendees to stand with him and support a warning label on sugary beverages in California. CrossFit Downey owner Oscar Ramos works to shatter cultural ties to Big Soda and educate his mostly Hispanic membership on the dangers of sugary beverages.